I took a day leave today. The alarm clock was set to ring at 7.45am meant for Clet to get up for his clinic appointment. It was not easy to drag myself out of the bed this morning but it's time to get up any how. I stayed up late last night trying to figure out how to use the accounting package that I got from my SIL recently. It is an accounting package I am not familiar with, there are so much data that I need to update into the system as I have not been updating it since the first day I started my little business 3 years ago. I also need to help Clet to update his businesses records as well. Small businesses can't afford to hire manpower to do the job yet, that's why! I had my breakfast while our girls still asleep and Clet has gone to the clinic. 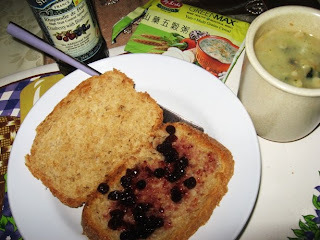 A set of "healthy" breakfast, home baked wholemeal bread with cranberry and raspberry jam, and a hot cup of Greenmax Yam Multi Grains Cereal. I finally bought the savoury one from Merdeka supermarket, it uses sea salt as one of its ingredients. Is sea salt healthier than the rest of the salt? I am still wondering??? 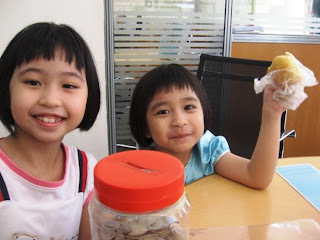 At about noon time, we brought our girls to the bank to bank in their angpow money and their coins. At first we wanted to find a bank which offers piggy bank for kid's account, it seems that not many banks do so nowadays, ended up we chose a bank which is convenient for us. As this is the first time we bring them along, Pearl was worried when their hard saving coins were taking away by the bank staff, she kept asking for her coins back..hahaha.. It's always good to cultivate a savings habit at tender age, you've made the right move!